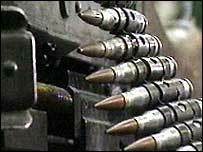 The IRA has put all of its weapons beyond use, the head of the arms decommissioning body has said. General John de Chastelain made the announcement at a news conference accompanied by the two churchmen who witnessed the process. "We are satisfied that the arms decommissioned represent the totality of the IRA's arsenal." Welcoming the move, Prime Minister Tony Blair said IRA decommissioning had been "finally accomplished". The general said: "We have observed and verified events to put beyond use very large quantities of arms which we believe include all the arms in the IRA's possession. He said they had handled every gun and made an inventory of the weapons. The arms included a full range of ammunition, rifles, machine guns, mortars, missiles, handguns, explosives, explosive substances and other arms including all the categories described in the estimates provided by the UK and Irish security services, he said. "Our new inventory is consistent with these estimates. We are satisfied that the arms decommissioning represents the totality of the IRA's arsenal." The IRA announced an end to its armed campaign in July. The republican organisation said it would follow a democratic path ending more than 30 years of violence. General de Chastelain's report confirming that IRA decommissioning had been completed was given to the British and Irish governments earlier on Monday. He described IRA decommissioning as "an important milestone towards the completion of its task to achieve decommissioning by all paramilitary groups". The leadership of Oglaigh na hEireann (IRA) announced on 28 July that we had authorised our representative to engage with the IICD to complete the process of verifiably putting arms beyond use. The IRA leadership can now confirm that the process of putting arms beyond use has been completed. The churchmen who witnessed the process were Catholic priest Father Alec Reid and ex-Methodist president Rev Harold Good. Their statement said: "The experience of seeing this with our own eyes, on a minute-to-minute basis, provided us with evidence so clear and of its nature so incontrovertible that at the end of the process it demonstrated to us - and would have demonstrated to anyone who might have been with us - that beyond any shadow of doubt, the arms of the IRA have now been decommissioned." The churchmen said they regarded IRA decommissioning as an "accomplished act". General de Chastelain, Andrew Sens and Tauno Nieminen - the commissioners of the Independent International Commission on Decommissioning - have been in Ireland overseeing the latest round of decommissioning since the beginning of September. Prime Minister Tony Blair said the completion of decommissioning was "an important step in the transition from conflict to peace in Northern Ireland". "The true importance of today is that these weapons can never again be used to inflict suffering and create more victims," he added. Irish Prime Minister Bertie Ahern said that it was a "landmark development" and appealed to unionists not to "underestimate the importance" of the move. "The weapons of the IRA are gone, and are gone in a manner which has been verified and witnessed," he said. Secretary of State Peter Hain said the announcement was the first step on the road to devolution being restored in Northern Ireland. "After all the bitter agony of the victims who have suffered, deaths and families torn apart, people will want to be certain, not just for a few weeks but for some months that actually this is being delivered," he said. "So far so good, today's statement was a landmark one which deals with the IRA's arsenal in a very credible way witnessed by independent people - but we have a long time to go to see whether we can actually get self government back on the road." Sinn Fein President Gerry Adams admitted the announcement would be "difficult for many republicans" but it was a "very brave and bold leap". Mr Adams said the British and Irish governments must now implement the Good Friday Agreement, with progress needed on outstanding issues including equality, policing, human rights, victims and on-the-run prisoners. However, unionists are unhappy there has been no photographic evidence of decommissioning and reacted with scepticism to the report. Democratic Unionist leader Ian Paisley said there had been no transparent verification of IRA decommissioning in the announcement. 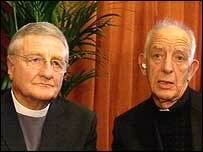 He said the church witnesses had been agreed by the IRA and as such could not be considered "independent". Without a photographic proof, an inventory and details on how the weapons were destroyed questions remained, said Mr Paisley. "This afternoon the people of Northern Ireland watched a programme which illustrates more than ever the duplicity and dishonesty of the two governments and the IRA." However, his deputy, east Belfast MP Peter Robinson said they accepted a significant amount of IRA weapons had been "put beyond use". Mr Robinson said they accepted it had been "a more substantial event than the previous events put together". In a statement the Ulster Unionist Party said it regretted that the move had "failed to maximise public confidence". "It is imperative that the movement's criminal empire be dismantled as well," it said.